As if the battle for the Silver Trophy needed anymore significance, the 2016 edition features both the Manhattan Indians and Junction City Blue Jays unbeaten at 5-0. Add in that both teams currently lead the Centennial League standings with two games two go, and you have the recipe for another classic. Manhattan has cruised to their first five wins by outscoring opponents 43-13. The Indians’ closest game was a 28-6 victory over Washburn Rural in Week 2. Senior quarterback Ian Trapp has lead Manhattan’s offense on the ground. Trapp, who transferred from Class 3A Ellsworth prior to last season, has rushed for 771 yards and 15 touchdowns this season. Iverson Robb has contributed an additional 542 yards on the ground and seven scores. Trapp has had some huge performances on the ground, including a 241-yard, four-touchdown effort in last week’s 42-21 win over previously unbeaten Topeka Seaman. Trapp has been less effective passing where he’s completed 43 percent of his passes for 350 yards and three scores. Junction City’s unbeaten start includes a hard-fought 26-21 victory over Topeka High and a fortunate 22-21 win over Washburn Rural. Against Rural, the Blue Jays won on a safety after a late Rural punt snap went through the end zone. Quarterback Ryan Henington has been exceptional for the Blue Jays. The senior has completed 62.5 percent of his passes for 939 yards and 14 touchdowns. He’s also rushed for 378 yards and a score. Jovon Baldwin is a threat for Junction City running the ball or catching it. Baldwin has 264 rush yards and two scores while catching 24 passes for 344 yards and eight touchdowns. Baylor Wilkey leads the Blue Jays with eight rushing touchdowns. Common opponents include Topeka High, Washburn Rural, and Highland Park. While Junction City struggled to get by the Trojans and Junior Blues, Manhattan topped Topeka 46-20 and Rural 28-6. The battle for the Silver Trophy began in 1949. The Indians and Blue Jays have split the last ten meetings in the Silver series and games have been incredibly competitive. Each of the last seven meetings has been decided by eight points or less. Expect another close one on Friday night. The Frontenac Raiders are set to play their third consecutive road game. So far, the road has treated the Raiders well. Frontenac won its two previous road games at Riverton and Southeast-Cherokee by a combined score of 125-0. 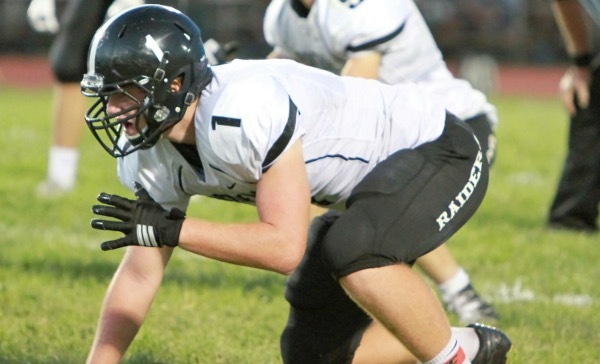 Last week, Frontenac rolled over Crawford-Neosho-Cherokee League rival Southeast 70-0. The Raiders dominated the Lancers, scoring 49 points in the first quarter. Behind quarterback Brandon Mlekus and running back Kooper Loy, Frontenac’s offense shined. Their defensive unit did the same as it recorded a safety and Dylan Flora returned an interception for a touchdown. Frontenac’s special teams were led by a Ryan Long’s punt block for a touchdown and Austin Madl’s kickoff return for a score. Frontenac has cruised through CNC competition thus far, winning its five games by a combined score of 228-33. Labette County, which is 2-0 in the Southeast Kansas League, will be Frontenac’s first nonconference opponent of the season. The Grizzlies have enjoyed quite the turnaround in their second season under coach Sean Price. A longtime coach in the area, Price enjoyed previous success at such schools as Chetopa and Columbus. Through only five games this year, Price has directed the Grizzlies to their most wins in a single season since Craig Hartman led Labette County to a 5-5 record in 2009. Last week, Labette County made a statement with a 43-42 win at Fort Scott. Grizzlies senior quarterback Logan Dean has passed for more than 1,100 yards and eight touchdowns. Junior Tanner Russell is Dean’s top receiver with 34 catches for 450 yards and a touchdown. Isaiah McPherson has rushed for 972 yards and 20 touchdowns on 116 carries. But unlike the Raiders, the Grizzlies have been more prone to allow points. Labette County has allowed 27.6 points per game. This contest, between two traditionally top-tier 3A teams, will likely decide the NCAA title. Beloit has an average score of 50-27, while Southeast of Saline has a margin of 40-13. Beloit is No. 1 in the league in offense by a substantial margin, and SE of Saline is significantly No. 1 in defense. Beloit opened the season with a 22-12 win at Concordia, a team known for its defense. Then, the Trojans have started to roll offensively like Beloit traditionally does. The Trojans defeated Ellsworth, 58-52, for the Bearcats’ last loss, rolled over Sacred Heart, 52-7, won 52-32 at Republic County and defeated Russell, 66-33, last week in a game that featured more than 1,100 yards of total offense. Beloit has a very experienced squad that went 7-3 last season and averaged 39.4 points per game in coach Greg Koenig’s double-wing offense. The Trojans have rushed for 402 yards a game and passed for 73. Senior Hunter Budke has rushed 124 times for 910 yards and 15 scores. Senior Caydren Cox has added 50 carries for 458 yards and six touchdowns, while senior Ryan Jackson has passed for 363 yards with a 5/1 TD/INT ratio. Beloit has run 61 snaps a game and averaged 7.8 yards per play. Overall, its 250 points stand second in Class 3A. The Trojans have committed seven turnovers and are plus-2 in turnover margin. Beloit’s defense permitted more than 600 yards against Russell last week including 269 rushing from senior quarterback Alex Windholz. Jackson has three interceptions, including a pick-six. SE of Saline has been a very strong home team the last several years with its large crowds and unique lowered field setting. The Trojans are 6-0 at home the last two seasons and 13-2 in the last four years. On the road, the Trojans are 13-7 in that span. The Trojans opened the season with a 28-20 road victory versus Republic County, a 54-6 win against Chapman, a 42-20 road victory versus Russell, a 24-14 win against Sacred Heart, and a 54-6 victory at Minneapolis. The Trojans, led by standout quarterback and receiver duo of Bryce Banks and Ben Murray, have averaged 355 yards per game, including 230 in the air. The offense averages 54 snaps a game and 6.6 yards per play. Banks has completed 77 of 127 passes for 1,151 yards with an 11/4 TD/INT ratio.He is also the leading rusher with 83 carries for 359 yards with five scores. Murray has 23 catches for 493 yards and eight scores. SE of Saline has five turnovers and is plus-six in turnover margin. Sophomore Dylan Marks has enjoyed a big year with 42 tackles, 10 for loss and six sacks, all team-highs. Russell’s Windholz did collect 178 rushing yards on 22 carries versus SE of Saline, but the Trojan defense held Sacred Heart to 31 rushes for 49 yards. SE of Saline won this game, 21-6, last season and ended a six-game winning streak against Beloit. In those six contests, Beloit averaged 46 points a contest. Beloit is 9-4 in the last 13 meetings. However, SE of Saline hasn’t scored more than 28 points against the Trojans since ’04. When SE of Saline wins, it’s normally low scoring. Banks and Murray will push SE of Saline over 30, but Beloit’s offense is rolling. Friday’s contest will likely decide the Heart of America League race is what is normally a low-scoring contest. Sedgwick is still in the mix at 3-1 in league play, although the Cardinals lost 44-21 to Marion and defeated Trinity, 27-26, in overtime. Marion won 28-8 last season after a 30-6 Trinity victory two seasons ago. Trinity is 4-3 in the last seven meetings. In four of the past five meetings, the combined score has not exceeded 39 points. Marion, long a solid program under veteran coach Grant Thierolf, went 9-2, 6-4 and 7-2 the last three seasons before a move back up to Class 3A. The Warriors have an average score of 42-11 and rank tenth in the 64-team classification with just 56 points allowed. Last week, Marion quarterback Jack Schneider had five rushing touchdowns as Marion defeated Sterling, 44-14. Defensive back Mason Pedersen picked off two passes as Marion’s defense held Sterling under 200 yards. Trinity, under fourth-year coach Jordan Bell, has already exceeded last season’s win total from a 3-6 year. The Celtics have a habit of moving up and down from one season to the next in wins. Since 2012, the Celtics are 5-4, 4-6, 8-2, 3-6 and now 4-1. Trinity has an average score of 28-15, including 3-0 on the road. Last week, Trinity bounced back from the overtime loss versus Sedgwick and won 8-0 at Ell-Saline on an Adam Sattler touchdown run with 39 seconds remaining in the game. He finished with 137 rushing yards, and the Celtic defense forced three turnovers. Last season, the Celtics tallied just 10 points a game and allowed 22.Trinity has multiple scoring drives end without points, including a holding penalty that negated a touchdown. The Celtics have tremendously improved on offense from last season, but Marion is much more explosive. One of four unbeaten showdowns in 8-Man, Division I will take place in District 1 where the St. Paul will take on the West Elk. Once a state power at the 8-Man level, the St. Paul Indians havent’ reached the playoffs since the 2010 season. After posting a 58-26 record from 2004 to 2012, the Indians went 4-13 over the next two seasons spanning 2013 and 2014. St. Paul finished 6-3 last fall. This season St. Paul has beaten a pair of Twin Valley League opponents in Frankfort (58-8) and Axtell (66-16). Last week, the Indians blasted Madison 54-6. Against Madison, Chandler Struthers rushed for 240 yards and five touchdowns. Struthers leads the Indians with more than 800 yards rushing in five games. Noah Winter is also a threat for the Indian offense. St. Paul has been stout on defense this season in giving up only a total of 30 points. West Elk has been equally good on defense this season. The Patriots have surrendered a total of 36 points with 20 coming in a Week 2, 68-20 victory over Oxford. On offense, West Elk averages 57 points per game despite losing some great talent to graduation last year. The Patriots lost Wisconsin signee Isaiah Loudermilk and speedy running back Armando Gomez who finished his career with nearly 4,500 rushing yards and 82 touchdowns. Junior quarterback Cade Miller is in his second year as a starter and has continued to put up big numbers. Miller, who rushed for 1,100 yards and 23 touchdowns last season, has 479 rushing yards and 12 scores through five games this season. Senior Chase Vandegrift leads the Patriots with 492 yards rushing and has nine touchdowns. Seniors Kolvin Berry (6-2, 250), William Young (6-3, 285), William McClendon (6-5, 230), Chase Bunyard (6-1, 220), and junior J.D. Helms (5-8, 190) continue to anchor the Patriot lines. This is a key district game with unbeaten Sedan also awaiting both teams in the final three weeks. Two undefeated teams match up in Eight-Man, Division I, District 4 following a pair of big wins for the squads in its district opener last week. Logan-Palco earned a signature win for the program last week with a 50-28 home win against Victoria. The Trojans ran 57 plays for 338 yards, while Victoria delivered 58 plays for 318 yards. However, Logan-Palco was plus-1 in turnover margin and held Victoria to 6 of 17 on third/fourth down. Logan-Palco, which never trailed, was 7 of 11 on third/fourth down. Junior tailback David Thompson again led the way with a huge performance with 32 carries for 224 yards and three scores. Thompson leads eight-man players in rushing yards (1,098) and rushing touchdowns (20). Logan-Palco opened 6-0 last season before district losses to Atwood-Rawlins County and St. Francis kept the Trojans from the playoffs. Osborne, 4-5 a year ago, was expected to significantly improve following the return of virtually the entire roster. The Bulldogs have three quality victories: 50-18 in Week 2 versus Beloit St. John’s-Tipton and 34-32 against Pike Valley in Week 4 followed by a 58-8 win at Solomon last week. Solomon entered the game averaging 51.5 points per contest but the Gorillas were held to their fewest points since former Osborne coach Steve Tiernan took over the program before the 2015 season. In many ways, Pike Valley and Logan-Palco are similar teams. Both lean heavily on an outstanding running back and have a quarterback who is consistent and rarely makes mistakes. Logan-Palco senior signal caller Josh Van Laeys has one interception in the last two seasons. Pike Valley, which missed a game-tying two-point conversion with 1:25 left in a 34-32 loss to Osborne, is bigger on the line than Logan-Palco. Osborne, which trailed Pike Valley at halftime, turned the game in the second half when it returned to basics and continued to hand the ball off to its backfield tandem of Cullen Grabast and Denton Schurr. Schurr leads the team with 554 rushing yards, while Grabast has 540. The duo has combined for 22 rushing scores. Osborne averages 7.5 yards per play, while Logan-Palco is at 7.7. Osborne is plus-9 in the turnover margin, while the Trojans are plus-8 but has just one turnover; neither from Thompson or Van Laeys. Thompson is going to get his yards – he had solid performances even in the losses to Atwood-Rawlins County and St. Francis last year – and Osborne allowed Pike Valley to rush for 346 yards, including 192 for Lane Peters. This game will likely come down to the play of Logan-Palco freshmen Cody Brown and Jed Peace, specifically at nose guard against Osborne’s more experienced line. Can Logan-Palco contain the middle enough to slow down Osborne? Another area is the field position; Osborne senior Justin Burch has 18 touchbacks on 30 attempts and his kickoffs forced Pike Valley to often drive the length of the field. This game is going to be very close but, Osborne, playing at home, earns the victory. Manhattan, Junction City, Frontenac, Labette County, Beloit, Southeast of Saline, Hutchinson Trinity, Marion, St. Paul, West Elk, Logan-Palco, Osborne, Bishop Carroll, Wichita South, Olathe North, Shawnee Mission West, Olathe Northwest, Lawrence Free State, Wichita Northwest, Garden City, Topeka High, Washburn Rural, Bishop Miege, Mill Valley, Pittsburg, Carl Junction, St. Thomas Aquinas, St. James Academy, Augusta, Buhler, Mulvane, Conway Springs, Wichita Collegiate, Andale, Halstead, Pratt, Columbus, Galena, Hoisington, Nickerson, Norton, Colby, Plainville, Sacred Heart, Burlingame, Clifton-Clyde, Dighton, Sharon Springs-Wallace Co.